A key challenge in Australia and globally is overcoming the cost of sewerage and water service provision in small, remote regional towns. Conventional schemes are cost-prohibitive and the environmental and health effects in unsewered areas of concern, particularly in sensitive environmental settings where infiltration disposal is not an option. The Lake Bolac Sewage Treatment Wetland – a project begun by Syrinx in 2010 and commissioned by Syrinx in 2012 – not only addresses these issues for Lake Bolac, but it demonstrates a methodology for how passive, low-cost sewerage systems can be successfully adopted by other similar regional towns. The Lake Bolac Sewage Treatment Wetland is a constructed passive wetland system treating the municipal wastewater of around 230 residents and visitors. Its treatment process comprises six main steps involving settling tanks (to remove coarse solids), woodchip filters (to remove fine particulates, oil and grease), dosing tanks, vertical subsurface flow wetlands (to reduce initial nutrient loadings) and free water surface wetlands (to remove nutrients and pathogens). During these steps, a large proportion of water is lost through evaporative processes, and any excess treated wastewater is released onto a biodiversity floodplain for disposal/reuse. The project faced a number of challenges. The site is located within a sensitive environmental setting between two conservation/recreation lakes with complex geology and groundwater systems. There was – and still is – no power to the site, available space was limited, timelines were tight and community opinions (due to the site’s visibility) were strong. Additionally, there is considerable seasonal variation in wastewater generation and water demand (due to significant tourist flux). One of the key drivers of Syrinx’s design process was to provide a range of value-adds (environmental, social, cultural) that elevated the project from a pure infrastructure provision to a natural and social asset and ensure an overall sustainable outcome. 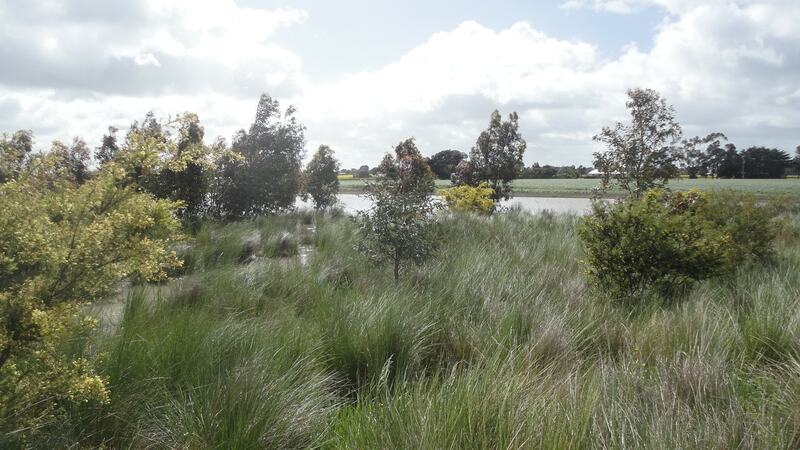 As such, the wetland treatment system was designed not only to ensure an adequate treatment of wastewater but also to enable a beneficial reuse option for excess treated wastewater via the creation of a floodplain wetland, which is modelled on a now rare ecosystem type in Victoria. The resulting system is well integrated into its surrounding environment, visually enhancing the landscape and improving the biodiversity of the area. It was built and is maintained by local people (under Syrinx’s supervision), thereby minimising long-term costs and encouraging local ownership.